Our 15 gallon hot-dipped galvanized tubs come complete with a reinforced rim, body swedges, and an offset bottom. They will last for decades of use even in the harshest of conditions, since they are resistant to elemental corrosion and guaranteed to be watertight. 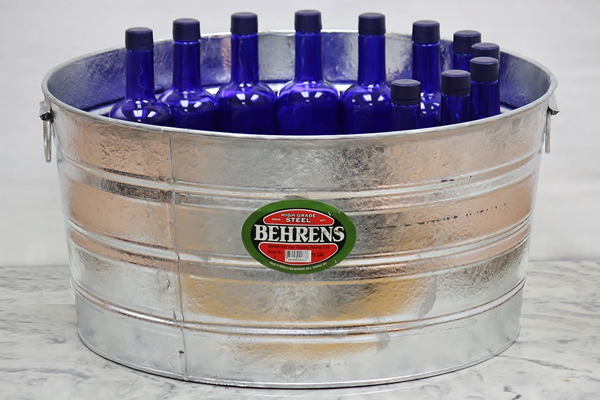 They make a perfect rustic cooler for your next tailgate or barbeque and hold up to 49 standard drinks. They can be used as rustic galvanized garden planters to give a dog a bath. We also offer a similar round galvanized tub in 17 gallon, 11 gallon, and 9 gallon sizes. You might also like this 15 gallon round tub in a smooth galvanized metal finish.